You probably noticed that we have fallen terribly behind with uploading new blog posts. Apologies!! No, we haven't stopped building. Quite to the contrary! Doing work on the tiny house has taken over almost every spare minute of our lives and unfortunately we haven't been able to finish and upload any new posts recently. We started this blog with the intension of offering some insights into the decision making process around the nitty-gritty details of planning and building our tiny house. 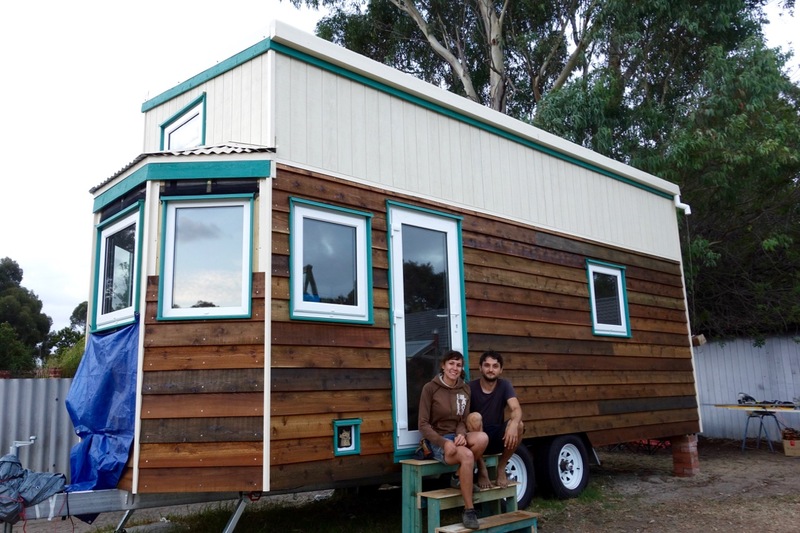 When we started doing research on tiny houses last year, we found lots of blogs full of "pretty pictures" taken during and after the construction phase, but a lack of discussion of the specific challenges that come with planning and building tiny mobile homes. So hopefully we'll have a bit more time on our hands to finish off our drafts on topics such as racking and bracing, why we opted for a ventilated rain screen and why we chose sheep wool as insulation. A little sneak peek: We have finished the outside of our walls now and it's all weatherproof just in time for winter. Phew! Great piece of info. I really enjoyed your article. I guess the Tiny life is well suited for me then. We are Izzy and Anz and we are building a tiny house on wheels in Western Australia. Follow our journey! Thanks to wildtextures.com for the background. All other material and media on this site belongs to timber&teal (2015).